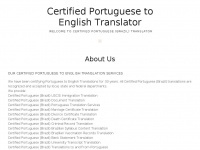 The websites creator or author is Certified Portuguese to English Translator. 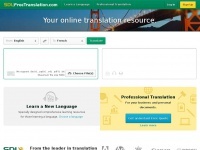 The web server used by Certifiedportuguesetoenglishtranslator.info is run by GoDaddy.com, LLC and is located in Scottsdale, USA. There are many websites run by this web server. The operator uses this server for many hosting clients. In total there are at least 15,611 websites on this server. The language of these websites is mostly english. Only a few websites on this web server are x-rated. Languagemarketplace.ca - Docu­ment Transla­tion Ser­vi­ces Cana­da | Transla­ting All ..
Translation-services-usa.com - Transla­tion Ser­vi­ces USATM - Fast 24/7 Ser­vi­ce, 15+ ..
Freetranslation.com - Free Transla­tion and Profes­sio­nal Transla­tion Ser­vi­ces ..
Tranexp.com - Transla­tion Ex­perts - Spa­nish transla­tion French ..